Bendix Italia S.p.A. Crema Black & White Servo Stickers. 56mm Pair. Each sticker measures approximately 56mm x 18mm. Stickers are cut to shape, the green square that you see is backing paper. Battaini Jacks Rovate - Varese Sticker. 1.5". A. Salamini & C. Black & Gold Oval Radiator Sticker. 2" or 3". Ferrari Circular Prancing Horse Stickers. Set of 4. 22mm, 50mm, or 60mm. IPRA Torino Red, Black, & Foil Shaped Sticker. 1". Fiaam Navy Blue & White Filter Sticker. 2.75". 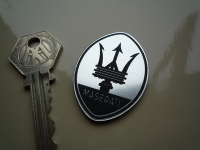 Maserati Trident Laser Cut Self Adhesive Car Badges. 1.75" or 3.25" Pair. Spider Script Style Laser Cut Self Adhesive Car Badge. 5.25". Maserati Shield Laser Cut Self Adhesive Car Badge. 1.75". Agip F1 IP Antifreeze Sticker. 3". 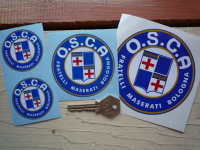 O.S.C.A Fratelli Maserati Bologna Round Stickers. 1", 2", 3" or 4" Pair. M.Riganti Off.Mecc. Cassano Magnago (Varese) Jack Sticker. 40mm. French Classic Racing Range of Scrapbooking Stickers Small Scale Labels. Set of 13. Set #4. Mille Miglia Radial Arrows style Round Sticker. 3.75". Bendix Servofreno Oval Foil Sticker. 3".